Software development would seem to be a quintessential example of today’s Internet-enabled “knowledge work”--a global profession not bound by the constraints of geography. 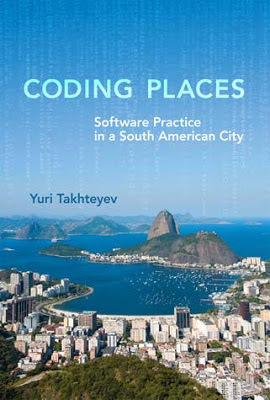 In Coding Places, Yuri Takhteyev looks at the work of software developers who inhabit two contexts: a geographical area--in this case, greater Rio de Janeiro--and a “world of practice,” a global system of activities linked by shared meanings and joint practice. The work of the Brazilian developers, Takhteyev discovers, reveals a paradox of the world of software: it is both diffuse and sharply centralized. The world of software revolves around a handful of places--in particular, the San Francisco Bay area--that exercise substantial control over both the material and cultural elements of software production. Takhteyev shows how in this context Brazilian software developers work to find their place in the world of software and to bring its benefits to their city. Takhteyev’s study closely examines Lua, an open source programming language developed in Rio but used in such internationally popular products as World of Warcraft and Angry Birds. He shows that Lua had to be separated from its local origins on the periphery in order to achieve success abroad. The developers, Portuguese speakers, used English in much of their work on Lua. By bringing to light the work that peripheral practitioners must do to give software its seeming universality, Takhteyev offers a revealing perspective on the not-so-flat world of globalization.